Though I'm careful about it, setting the scene has always been something I've found really helpful when doing user research - I ask a participant to imagine they’re in a particular situation and have a particular need. This was until I was working on the Redundancy Payments project. It's nice to imagine yourself going away on holiday or buying a smart car, but when you've just been made redundant, the company owe you money and you have bills to pay... these are not nice feelings to conjure. 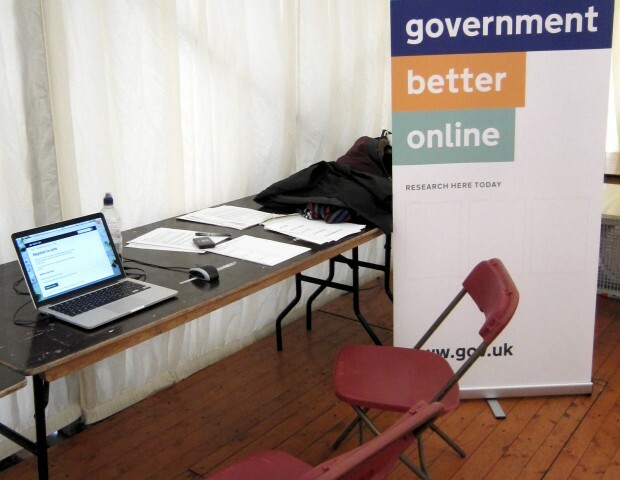 At GDS we want to make sure that people who struggle to use the internet can use our services. We realise that many people ask friends and family to help them complete tasks. Friends and family often do the typing for them while they answer the questions. With these thoughts in mind I had an idea. What if I pretended I was the person who was made redundant and the research participant was my friend helping me get money owed? I could take on the sadness, annoyance, confusion, disappointment and, if appropriate, anger at what had happened to me. The participant could act as my help, they could ask and reinterpret questions and give information to me in their own words. I facilitated research sessions from the seat in front of the computer and asked my participants to instruct me as to what I should do and explain the interface and content for me. We discussed where there was confusion just as we would in a normal set up, but it took some of the emotional stress out of the subject matter and it took any difficulty in using the computer out of the way. It worked a treat. I was very surprised and happy. It helped me understand what people need and at which points, where we were using the wrong terminology, which questions were ambiguous, and so on. The participants were really engaged. They wanted to make sure I didn't lose out on the money that was owed to me and they paid attention to the questions and the service in a way that I've not seen before. Plus, it was fun to watch, I am told! You need to read your participant and check how well they'll engage. Maybe it's the natural 'helpers' who get into it best? I don't use this technique in every user research session, but it's a great tool to pull out when a change is needed. Good post. Picking up on emotional response is often overlooked especially just online testing. Asking the right questions key to user research and so hard to do.